In this case, you already have a Free subscription plan! This is a great way to learn the capabilities of our service and even use it in your work, creating a couple of diggers and collecting the necessary data for you. We do not impose any serious restrictions to use the service in the free plan. You can create, test and run diggers of any complexity. You can run them manually or schedule them. Export data in the required format or use API. 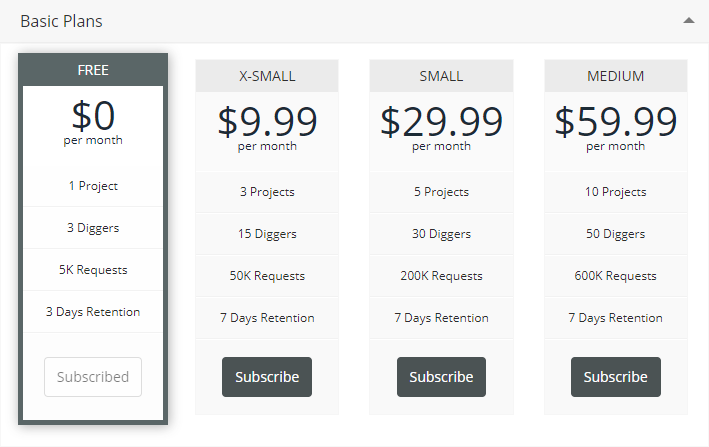 For many of our users, who need to scrape data from one site or another, or collect a small amount of data a couple of times a month - this is an ideal subscription plan. 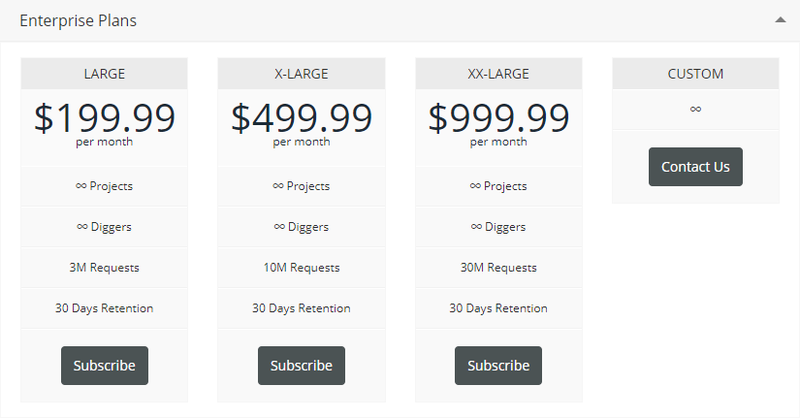 But if you need large amounts of data or you want to scrape data from various websites and you need a lot of diggers, then you need a paid subscription. You can upgrade your free subscription to paid in this section of the website. To subscribe, you must select the required plan and click the Subscribe button. If you have not yet chosen a payment method, the system will prompt you to fill out the information required for subscription first. For more information on choosing a payment method, please refer to this section of the documentation. At any time you can cancel or suspend the subscription. In this case, the system will stop the monthly charges and automatic renewal of your paid resources and will transfer you to the Free subscription plan as soon as the billing period for the current subscription ends. It means that after paid subscription cancellation, you can still use it until its current term expires. To cancel the subscription, fill in the appropriate form (optional) and click the Unsubscribe button. you cannot cancel free subscription. If you change the current paid subscription plan to a smaller one (including Free) or to a larger one, or when you applying a coupon to the current subscription plan, changes to your account will occur only at the beginning of a new billing period. If for some reason you want to cancel the change of subscription and stay on current, you can click on Back to this plan and the change of subscription will be canceled. If you change the current Free subscription plan to paid, the subscription will be upgraded immediately and you will receive all services available for paid subscription instantly. If the subscription plan changes from greater to smaller, the number of available resources also changes accordingly. Since the new smaller subscription plan has less number of allowed diggers, the system may impose restrictions on already existing diggers. 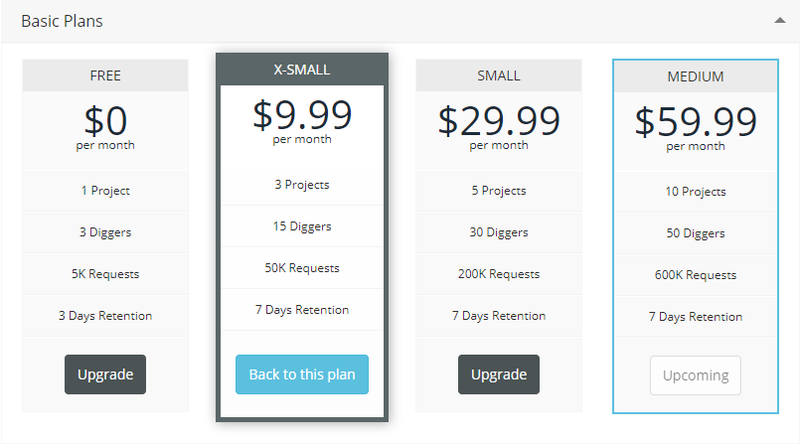 Diggernaut will reduce the number of your diggers to match number of allowed diggers for your new subscription plan by applying the principle new ones gets disabled, and old ones remains. All disabled diggers will be shown as Restricted. The system will leave the already created projects for you, their number will not be changed, but it will be impossible to create new projects if the limit is exceeded. On all subscription plans, including Free, resource updates (requests) are made at the very beginning of each the settlement period (every month). Diggernaut provides special conditions for those who do not want to spend time on developing and maintaining diggers. Contact us and we will tell about Full Managed Solution!